The Western Lakes and Atlantic Challenge (WLAC) is a fun and challenging sportive cycling event with two distances to choose from. 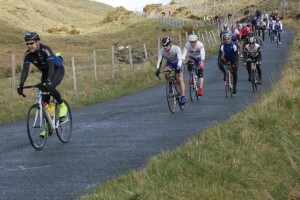 A long 144k cycle for the endurance athlete which starts and ends in Salthill, Galway, takes the cyclists through Connemara, and is the perfect goal for anyone who wants to get a long cycle done early in the year to set themselves up for a summer of racing, triathlon or recreational cycling. We pride ourselves on the fact that many novices who take on this cycle are taking on the longest distance they have ever completed. And they are able to do it because they are well looked after by our team on the food stops and support vehicles. Entry fee and sponsorship will help fund local charities. Speech and Language Therapy services for Down Syndrome children in the Galway area are provided by Voices for Down Syndrome Galway, which has received over €12,000 since the event started. The two sports clubs involved,Galway Bay Cycling Club and Salthill Knocknacarra GAA Club, also use the event to help fund their juvenile sections. See the 2018 summary of where the money goes for more details.